on the woodside. 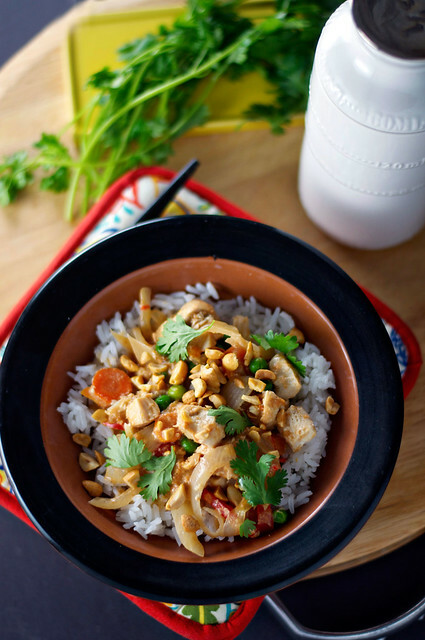 : *slow cooker thai chicken and rice. 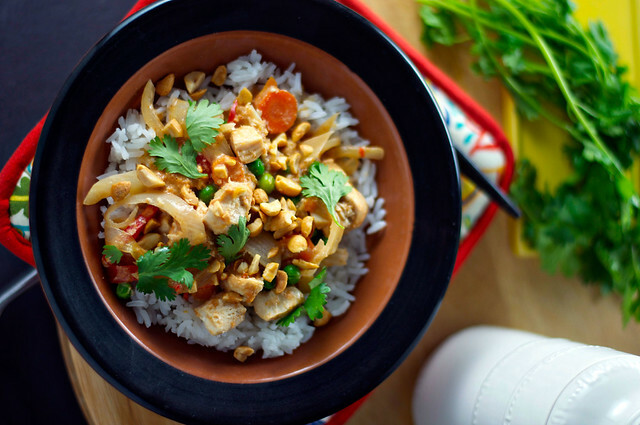 *slow cooker thai chicken and rice. I had every intention of beginning this post with, "A few months ago, I pinned ... " And then I revisited my Pinterest yum board and realized I pinned this recipe a year ago. Which is just proof that I have no concept of time and good lord where did 2013 go? When I pinned this recipe a year ago, I commented that it would be a great thing to try for my first attempt at slow cooking, should I ever procure a slow cooker. And then I did procure a slow cooker, a Christmas gift from my dad and his husband, almost a year ago, and I developed an unhealthy fear of ... cooking things slowly. Partly I think that's because I am not really familiar with slow cooker recipes, so I didn't know how to recognize a good one when I saw one, partly because I'm generally more a fan of recipes that have lots of fun but easy, therapeutic steps, and partly because I have a healthy fear of burning my house down. Yes I know that you are statistically pretty unlikely to burn down your house with a Crock Pot, but I've always been a little ahead of the curve, accident-prone-wise. This past Saturday's forecast called for a rainy half day and lots of people in my life who I count on to entertain me being busy or asleep, so I dragged my wilted Friday afternoon self to the grocery store and prepared for my maiden voyage. Personally, I appreciated the prep work this dish required, even though I understand why the typical Crock Pot dump-and-cook approach is considered extremely valuable among the slow cooker set. What I enjoyed most about my first slow-cooking experience is that I got to do all of the things I like about being in the kitchen—chopping, whisking, mincing, peeling (well, not peeling so much; my knuckle was not the biggest fan of that part; see above re: accident prone)—but not doing the cooking myself made it feel a little bit like a magic trick. Insert ingredients, abracadabra, and presto! Dinner. I made some adjustments to the original formula—I forgot the coconut milk, so I substituted what I had on hand, which was heavy cream. (Full disclosure: On my tombstone, it shall read, "Here lies K. She forgot one ingredient.) I also don't have access to quick-cooking tapioca, so I subbed cornstarch as a thickener. I really liked the tenderness of the chicken and the hint of curry and peanut butter, but after five and a half hours of cooking, some of those the flavors needed a little brightness—the lime stands up beautifully (and only improves as leftovers), but a little sriracha and chopped roasted peanuts give the heat and salt a little boost. For color and life, cilantro comes in super handy. So big thanks to Love at Home for being my inspiration! I made a big meal with very little effort, and I didn't burn down the house. Just right for a rainy couch-bound day spent testing my mental health by watching too many episodes in a row of The Newsroom. 1. Place first 3 ingredients in a slow cooker; top with chicken. Whisk together chicken broth and next 8 ingredients in a medium bowl until smooth. Pour over chicken and vegetables. 2. Cover slow cooker, and cook on low 5&frac12 hours. Stir in cream and peas; let stand, covered, 5 minutes. 3. Serve chicken mixture over hot cooked rice. Garnish, if desired. Makes 8 servings. This recipe is good bit needs a heat element. I would add cayenne pepper to round out the flavors. This was an excellent recipe, thank you so much! My slow cooker is currently bubbling away :) Someone also commented asking about the time and heat. The 5&frac12 hours is just coding gone wrong - its actually 5 & a half hours (explaining the "frac" = fraction 1/2). Thank you so much!